VANCOUVER, BC / ACCESSWIRE / April 16, 2018 / MGX Minerals Inc. ("MGX" or the "Company") (CSE: XMG / FKT: 1MG / OTCQB: MGXMF) is pleased to announce that its wholly-owned subsidiary ZincNyx Energy Solutions Inc. ("ZincNyx") has developed new methods to expand the capacity of its zinc-air fuel cell battery as part of the mass production design phase. ZincNyx has developed a patented regenerative zinc-air flow battery that efficiently stores energy in the form of zinc particles and contains none of the traditionally high-cost battery commodities such as lithium, vanadium or cobalt. The technology allows for low-cost mass storage of energy and can be deployed into a wide range of applications. Unlike conventional batteries, which have a fixed energy/power ratio, ZincNyx's technology uses a fuel tank system that offers flexible energy/power ratios and scalability. The storage capacity is directly tied to the size of the fuel tank and the quantity of recharged zinc fuel, making scalability a major advantage of the flow battery system. In addition, a further major advantage of the zinc-air flow battery is the ability to charge and discharge simultaneously and at a different maximum charge or discharge rates, since each of the charge and discharge circuits are separate and independent. Other types of standard and flow batteries are limited to a maximum charge and discharge by the total number of cells as there are no separation of the charge, discharge and storage components. 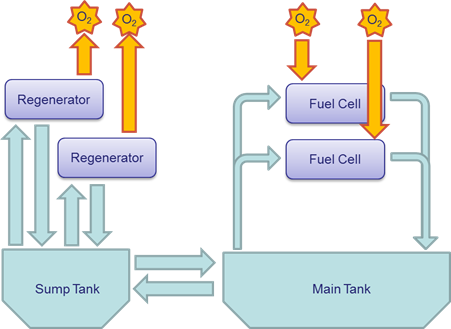 The basic system consists of a Regenerator unit, the Main Tank and a Fuel Cell. When the system is recharging, electrical power is used in the Regenerator unit to produce fine particles of zinc within a bearer electrolyte. As the system continues to be charged, the zinc particles are collected in the Main Tank, surrounded by the common electrolyte and oxygen is released to the air. 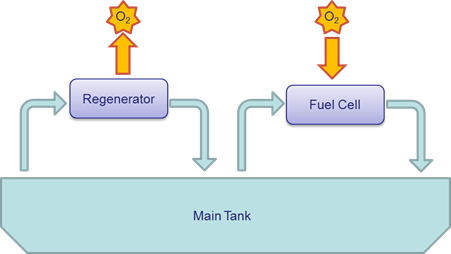 Although the Main Tank of the basic system may be made of any suitable size, there are practical limitations to the physical size and electrical capacity of the Regenerator and Fuel Cell units. ZincNyx has overcome this restriction by developing an expanded capacity system wherein multiple Regenerator units and multiple Fuel Cells can be assembled into a single system to deliver a wide variety of configurations and capacities that can be optimized for individual applications. This press release contains forward-looking information or forward-looking statements (collectively "forward-looking information") within the meaning of applicable securities laws. Forward-looking information is typically identified by words such as: "believe", "expect", "anticipate", "intend", "estimate", "potentially" and similar expressions, or are those, which, by their nature, refer to future events. The Company cautions investors that any forward-looking information provided by the Company is not a guarantee of future results or performance and that actual results may differ materially from those in forward-looking information as a result of various factors. The reader is referred to the Company's public filings for a complete discussion of such risk factors and their potential effects which may be accessed through the Company's profile on SEDAR at www.sedar.com.